Ultimate Dragons 2.0 has been revamped! I remake almost animations. More stable and more exciting! No need to create a new game and wait re-spawn dragon when this mod installs and upgrades. Adds new animations of dragon attacks for the first time in the world, This is the most important feature of this mod. Visual effect and attacks are depend on type of dragon. Swing Breath Fire or frost breath moves toward the right from the left. Tail Attack Attacks with a tail while rotating nearly 180 degrees. Tail swiping Sweeping attack of the tail from the right or left side. Stamp Raise foot greatly and stamp. Shock wave also damage. Bite Runforward Run and bite. Dragon slightly tracks a target. Bite Over Head Raise head greatly and then bite. Bite Rotation Bite while rotating. Proximity meteor Drop a meteor in four directions around the dragon. Location is fixed. Ranged meteor Drop four meteors towards a target. Homing icicle Icicles tracking a target. Ground blast Explode at random in front of a target. Rock and steam come before it explode. Faas Ru Maar(Dismay) Fleeing NPC be affected by shouting. Player has no fear effect, but player staggers a little. Fus Ro Dah NPC is knocked down by shouting. The player is no knock down, but stagger a little. Iiz Slen Nus Freezes the NPC. Marked For Death Armor are weakened for a limited period of time. Range is narrower than the other shout. High levels of dragons can use it. Parry Dragon parrys an attack from front while threatening. and then the dragon may counterattack. Summon Spectral Dragon Summon two small snake-like dragons. Circle flames Shoot the fireball in eight directions. Dragon doesn't fly more than other mods. Dragon is limited to target tracking performance while shouting. Dragon has taken a little longer preliminary movement before shout. Making it easy to take positions at reduced turning speed on the ground. Dragon considers position of a target to some extent, but basically attacks at random. The four different body part: head, wings and tail. 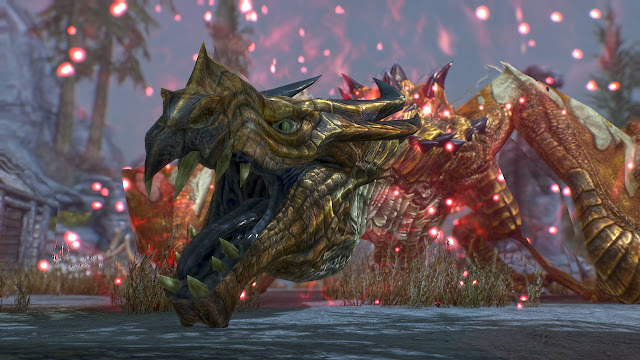 When locational damage is accumulated certain level, dragon lies on the ground and reduce ability. Try to aim at the body part intensively as the situation demands. Durability is different by body part. You can take the alchemy of new material from a corpse if you succeed destroy tail or wings. It is useful against dragon. If you keep dragon irritating, he get violently angry with shouting. 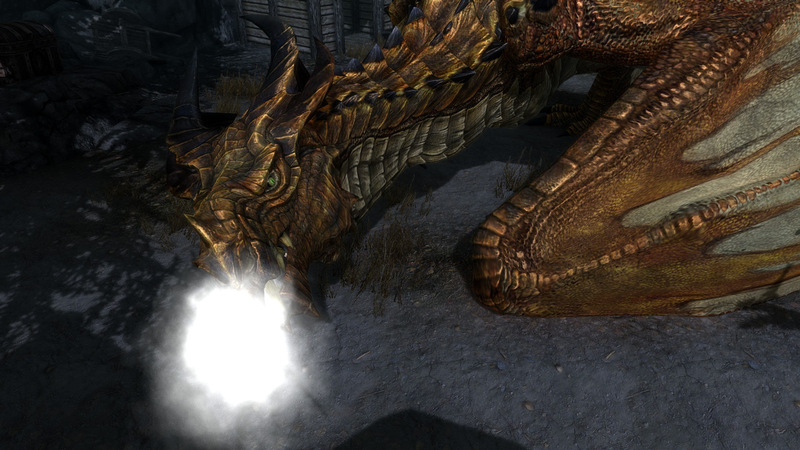 Dragon exhales smoke at the mouth during angry. Dragon increases speed of some actions and deal attack damage, and also incoming damage in exchange during angry. Dragon health has maximum three times by default. Dragon has maximum health and damage regist deponds on own or your level. Maximum health can be configured in MCM. There is no increase in attack power except when angry. Attacks damage or magic damage(included breath) can be configured in MCM. Dragon deal damage from NPC is reduced 50% to 75%. Setting is based on the book "There Be Dragons". Dragon uses meteor and never uses both ice and flame. A staggering attack(power attack or bash) each time, the stagger time becomes shorter. Finally, dragon has immune stagger, but it will be reset immune after a certain period of time. It is reinforced with magic via a script in order to avoid conflicts as much as possible. Reduce the impact on your PC as much as possible by using SKSE plugin. It can be used with other dragon overhaul mod. (I do not recommend because it may not have a good game balance) Please put "Ultimate Dragons.esp" under than other dragon mod in load order, because perk for dragon probably conflicts with other mod. I recommend you to set HP magnification to 1.0 if you use with other dragon mod. If dragon's health is 32767 and more, force health to 32760. Because it occur "no received damage" bug on this condition. Stagger Resist Toggle option on to dragon has staggered resist. MeleeDamageMult Set dragon deal melee damage multiplier before combat starts. MagicDamageMult Set dragon deal magic and shout damage multiplier before combat starts. Acitve Mod Active Mod: Function stop of distribution script. Please turned off when uninstalling. KillMove Rate Set rate of killmove that player or NPC is killed by the dragon. Flying Rate Flying Rate:Set rate of frequency flying. "Vanilla" is the highest rate. If such has a problem to quest progression related to Dragon, try to off it before start quest. If you don't still install SKSE, please install SKSE. Activate the UltimateDragons.esp in your mod launcher by checking its box. Just overwrite files. No need to make a clean save. Must not be state of fighting the dragon before save game. Exit game, and then removes this mod using all files. Ultimate Combat and TK Dodge also use Data\SKSE\Plugins\InsertAttackData.dll. 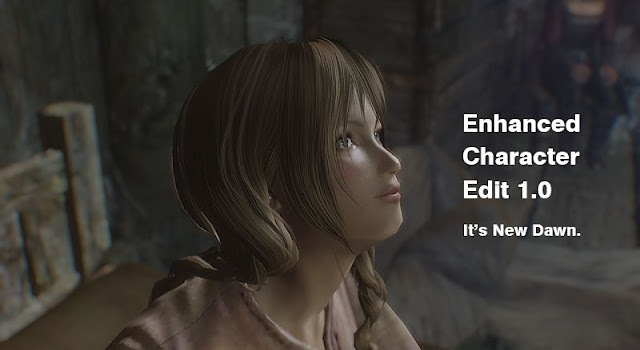 Do not erase when uninstalling. - Sometimes dragon cannot play additional animation. - Sometimes dragon cannot play effect in swing shout. You can enjoy more if use those. Ultimate Combat: NPC combat overhaul mod was made with the same concept. TK Dodge: Adds dodge animation for player. TK Hitstop: Gives the feel when attack hits. Theme is dynamics in version 2.0. Technical breakthrough has been made to improve stability and more complex expansion. Low-leveled dragon health was too high. So Health change the maximum magnification setting, Health grow up like S curve. And we made a difference depending on the level zone to make sharpness. Added a weighted random list so that the behavior frequency and pattern depends on the level. Addtional attacks was slowly and low damage. So these take more damage. Damage can be changed in MCM. Dragon more speeds up when raging. We made vanilla too fast to regain feather attacks that could not be overpowered so that hit timing was greatly delayed to make it easier to deal with. Techniques that can not be handled by this are almost eliminated. In order to work with Blender 2.7, I wrote the script and fixed it completely, starting with the rigging part. I think that it is more natural and easy to understand, and the tempo feeling has improved. I rewrote AI so that I can make ambiguous (fuzzy) judgment. If it is close to 60 degrees, there is a high probability of issuing a skill of 60 degrees, and if it is close to 50 degrees, the probability of producing a technique close to 50 degrees is high. Although it is a new technique, it became dynamic as it was able to set the amount of movement and the amount of rotation. Running bite and tail rotation are the main features. I am abolishing or replacing the technique whose purpose or hit judgment is not clear at a moment. Since the control of breath is frequent and it can be said to be the main weapon of the dragon, I think that it is important to manage this here. Until now, I kept the angle restriction of the neck in advance, I moved and stopped rotation during brace control, but there was a problem. Vanilla's breath is moving and rotating, there are places where you adjust the distance and angle of the target with this, and if you restrict this, it becomes like a fixed turret with little movement. Especially if the player is a long distance bow or magic character it is not fun. Also, if the movement stops suddenly, it is unnatural, and if you do not track from the middle, it will make it difficult for you to feel tense depending on the position. When lowering the tracking performance, it is easy for breath to rock, so if it is raised it will not be enough to raise it so we will make it variable according to the situation. It probably becomes more difficult to avoid than before, and position adjustment also functions, so I think I can keep a feeling of tension. I really like adding a fireball. It takes feeling of tension because it will not hit if you run, but if not it will hit. I implemented in core part of Havok Behavior, So improved stability. I was thrilled when I saw a trailer of Skyrim, but it is an honest impression that vanilla's battle against the dragon is monotonous and not so funny. - Dragon fly too frequently. - Too few attack patterns. - Bress tracking and turning perfomance is too high. No way to avoid attack. - I can safety win by alternating Bash and Power Attack. I tried to use some dragon mods. I felt as follows. Enjoy rogue fighting by useing summons such as draugr, but reduce specialty of dragon vs dragonborn. If simply increase the offensive strength, dragon become unreasonably strong. I felt boring if player's inoperable time is long by blowing up. So I make it myself. But, there was a considerable challenge in terms of the technical. There are severe restrictions to intervene in AI. Even interrupting was a hard time. It is difficult to prepare motion to move or rotate from a place, I finally spent to understood it about 3 years or so. And It took a year to complete. In the adjustment of the strength, I aimed to funny AI. It's existence to be defeated by the player. The feeling of funny fight is felt by players moving frequently. So I don't implement paralysis and blow off attacks. NPC will fight Dragon regardless of faction. Therefore, Dragon may be knocked down by NPC. So we raised the resistance to damage from NPC and prepared shouts for NPC. By the way, the name of Ultimate is taken from English text of Bechamimi who cooperated with English translation of TK Hitstop. There is no particular meaning only by simply having a word.